Believe it or not, Valentine’s Day is only a few weeks away! Since the best gifts sell out quickly or get backordered, it’s time to get shopping! That’s why today I’m sharing my Valentine’s Day Gifts for Her! Don’t worry, I’ll be sharing a Valentine’s Day Gift Guide for Him next week, but I had to share one for the ladies first. This leather jacket with gold hardware has quickly become a staple in my closet! It goes with everything and it’s the perfect thickness, meaning it keeps me warm, but is not overly heavy. I love pairing it with these heels, which I also own in black leather. Another great gift is this cozy robe, which I’ve owned for YEARS. If you don’t have one yet, you need to hit “Add to Cart” NOW! 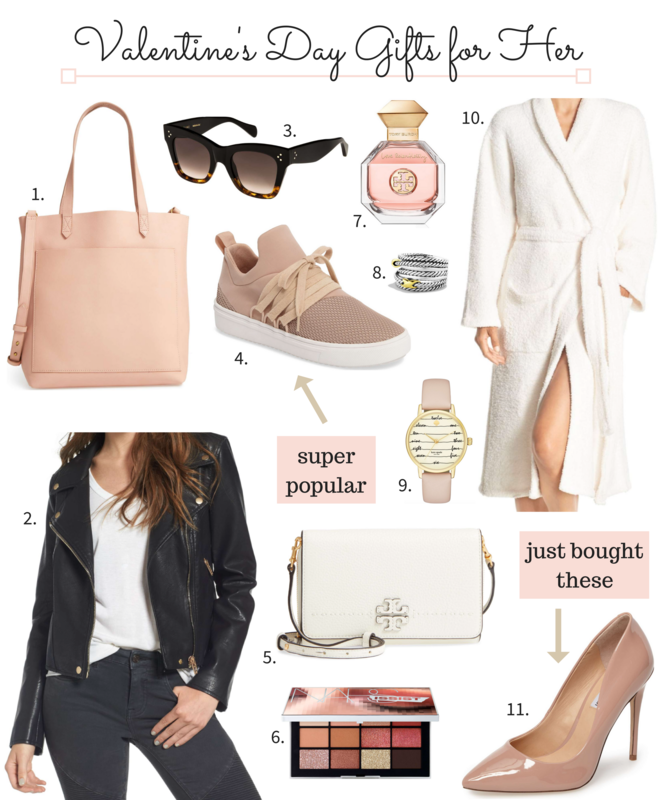 As for items I’m currently crushing on…have you seen these blush sneakers?! Surprisingly, blush goes with a lot of outfits! It adds the perfect girly touch! And what about this white Tory Burch crossbody?! It’s a bag that is not only great for winter, but will transition well into spring and summer! I think that any girly girl in your life would love any of these items. However, if your significant other is more of the athletic type, then see the items I picked out in this post. Also, check out this post for a quick Valentine’s dessert popcorn recipe!